Inspired by our kitchen transformations to revamp yours? This freestanding kitchen was inspired by the Swarbricks' desire for a fresher, lighter space. Find out how they did it. 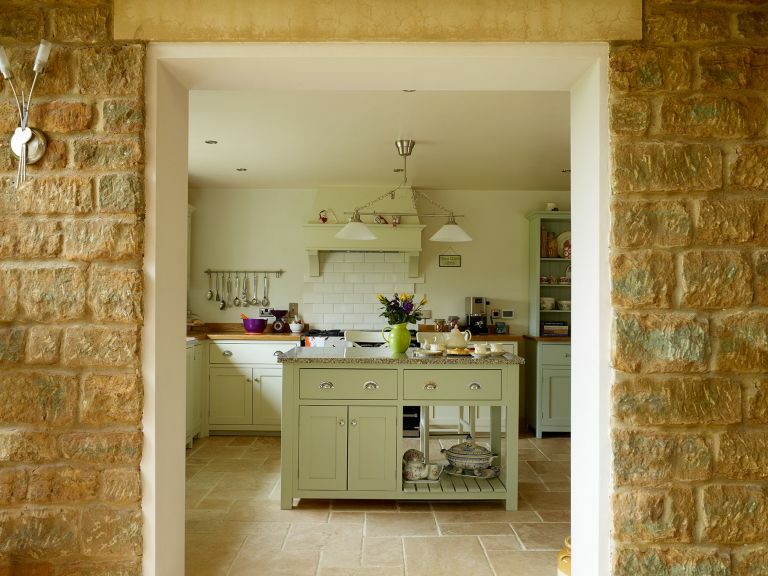 The couple opted for the handmade Real Shaker kitchen, with its combination of functionality, craftsmanship and understated style, and were able to choose colours and handles to customise the finish. Back at home, work began on stripping out the old units and preparing the floor and walls for the new installation. ‘The dining room is situated off the kitchen, so we needed the floor to flow through, too,’ explains Caroline. ‘As this room had already been renovated, there was some levelling required and the preparation process was arduous. We had to remove two lots of previous floor tiles before the levelling compound could go down and the underfloor heating could be installed – all of which we did ourselves.’ The couple ordered the heat mats online and found them straightforward to fit, and Steve then tiled the floor, with Caroline following up with the grouting – a new skill that she picked up during the project. After the walls were painted in tranquil neutral colours, it was time for the units to be fitted. Caroline and Steve opted for a combination of fitted and freestanding furniture, including Caroline’s dresser and a large central island, which were both painted to provide a little contrast to the fitted cabinets around the sink and cooker. Steve undertook all the fitting himself with just a little help from a carpenter for the oak worktops. To add interest to the scheme and for practicality, Caroline sourced a granite surface from a local firm for the island and sink area, which gets plenty of natural light from the window behind. The addition of a large pantry unit and fridge-freezer, perfectly concealed behind doors, ensures plenty of storage. ‘The cupboard space is cleverly designed with very deep shelves, and even the door itself has room to house smaller items such as spice jars,’ says Caroline. The last appliance to be fitted was the made-to-order range cooker, with a splashback of contemporary tiles.